Size: 338 sq.ft. - 482 sq.ft. UNA Project by NSHAMA Developer is a premium construction by Properties that features studios and one bedroom apartments which is located in the town square.Nshama Town Square is a mega real estate development was announced in March 2015.The project gives access to 2 U shaped buildings, G+11 floors, diagonally contradictory rawda apartments. It is Comprising of studios- 3 types and 1 BR - 5 types. The apartments are styled with a mix of modern furnishing, crafted objects and contemporary pieces. The group has created a personified, breathable atmosphere that facilitates the new generation. The apartments will be ready to move in by 2020. Nshama UNA Project is a two buildings concept developed by Nshama Developer in Town Square Dubai. This development features 1 BR & Studios apartments and is said to be targeting younger residents and smaller families. The Group provides sustainable communities that are consisting of apartments with a range of modern amenities with the best in facilities management and lifestyle features. Studio residents are starts at AED 400,888 sizes ranging from 338 sq. ft. & 1 bedroom apartments starting from AED 518,888 covering 480 sq. ft of area. UNA is at Town Square and close to public transport, cafes and other major shopping venues. The resident has become part of the vibrant Views community which offers easy access to Dubai Marina, Dubai Internet City, Dubai Media City and Knowledge Village. With business nerve centres the leisure attractions, educational institutions and retail centres are in easy access. 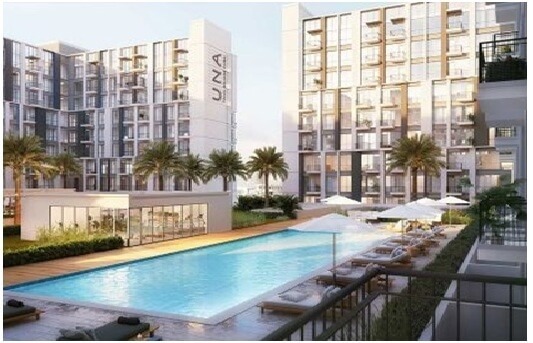 The UNA resident is today one of the most sought-after residential developments in Dubai. Nshama UNA project is located directly on Town Square within the space between Al Qudra Road and Emirates Road. Laundry services, Cleaning services, Restaurants, Cafes, Supermarket, Common landscape areas, Lobbies/lounge, Work space/business centre, Meeting rooms, WiFi internet, Reading area, Entertainment area, Gym, Recreational area, Shuttle service to the nearest metro station, Swimming pool are some of the amenities that UNA provides along with an open-minded and creative community. Schools: - Raffles Primary School Arabian Ranches, Jumeirah English Speaking School, Victory Hights Primary School. Hospitals: - Mediclinic – Arabian Ranches, Blue Oasis Veterinary Clinic, Saudi German Hospital, Al Zahra Dubai Hospital, Aster Medical Centre. Metro Stations: - Mall of the Emirates Station, Dubai Internet City Metro Station, Sharaf DG Metro Station.